Europe now know eight members of their 12-strong team for next month's defence of the Solheim Cup against America. The Spanish pair of Carlota Ciganda and Azahara Munoz, as well as Anna Nordqvist of Sweden and Germany's Sandra Gal, booked their places through their world rankings on Sunday. England's Charley Hull and Melissa Reid had already secured their spots in Germany, along with Suzann Pettersen (Norway) and Gwladys Nocera (France). Four wildcard picks will be added. Europe captain Carin Koch will make that choice on Tuesday after the qualification period ended following last weekend's Canadian Open. The United States have 10 players confirmed, with captain Juli Inkster restricted to two wildcard picks under her country's selection policy. 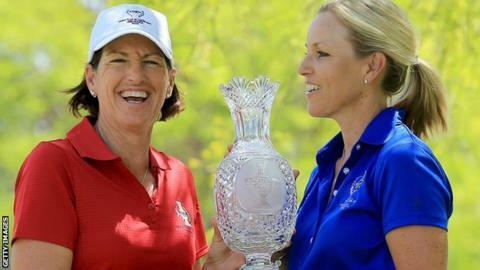 The qualified players for the US team are led by world number three Stacy Lewis, who lost in a play-off in Canada on Sunday. Also sure of their places are Lexi Thompson, Cristie Kerr, Michelle Wie, Brittany Lincicome, Morgan Pressel, Angela Stanford and Gerina Piller. Europe will look to win it for a third successive time when the tie takes place at the Leon-Rot club near Heidelberg, Germany from 18 to 20 September.